Guess what? You can now book a Walt Disney World room or vacation package for dates in 2017! (499 days in advance, so currently as of end of June I can book through the end of October/beginning of November). 2017 Disney packages came out yesterday, and I have already been busy quoting for my clients. The best part about these packages is that it only requires a $200 deposit (for room only it’s a deposit of one night of the price of the room + tax) that’s it! Also, the balance isn’t due until 30 days prior to travel! You can make changes, switch dates, cancel, etc. up until that point. I have been booking Disney travel for my clients over six years and would love to plan a vacation for your family. Common misconception: It does not cost you anything extra to book through me. Why wait on hold on the phone or stress about how the website works, or how to get discounts when I can do it for you, and give you all of my best tips and knowledge from years of experience? I can make it easy for you! I can also book your Disneyland or Disney Cruise Line vacation for you, as well as Universal Studios Orlando. Simply email me for a free no obligation quote. I would love to get you started or answer any questions you may have. heather@travelwiththemagic.com is where you can find me. Let’s get to planning, I can’t wait for you to experience the vacation of a lifetime! QOTD: Are you planning to visit Disney in 2017? I know I have already told you about my royal welcome Thursday, Jeff Galloway Meet Up, the Expo, the 5k and the half marathon, and my blogger meet up, but there were a lot of other fun times during my trip as well that I wanted to share with you. Friday after I met my mom, Karen and her mom at the expo, we went to Animal Kingdom Lodge and picked up my luggage. We then headed to the Grand Floridian where we would be staying on the concierge level of the main building for four nights, with a Magic Kingdom view! We had just enough time to change clothes and freshen up before appetizers were being served in the lounge. We relaxed and ate, then headed over to EPCOT for the pasta in the park party. I was given a free ticket though my fun blogging weekend, and my group was able to buy tickets even though it was sold out! The party was in the wonders of life pavilion, somewhere I had never been before. It was open seating, and they had little buffet stations (of the same food) set up all around the place. We found my FitFluential friends, grabbed some plates, and chowed down. There were a couple difference kinds of pasta, chicken, bread, salad, and dessert. One of the employees in charge of the logistics of the runDisney races came over and chatted with our group. Did you know Princess had about 600 port o potties?!? After we ate, everyone had pretty much cleared out. One thing I did NOT like about this event is the music was playing SO LOUD you couldn’t talk to anyone at your table! Come on Disney, music is nice, but lower the volume please! We took advantage of everyone leaving and went to take some pictures with the princesses. It was time to go, so we made our way out and did a little shopping before Illuminataions. Oh, we also had special wristbands that got us into a VIP seating area for the show. It was nice to sit on the ground without people crowding all around us. We actually left a couple of minutes before it was over. I have been to this rodeo, and I know there is a mad dash for the monorail afterwards. We were able to get on the second one and head back to the lounge just in time for dessert. When we got back to the room, we realized Wishes was about to start, so we watched that from the balcony. After being all firework-ed out, we headed to bed. After all, we had a 5k in the morning!!! My take on the Pasta party: I am glad I went to experience it, but I don’t think I would go again for the price. it was almost $50, and the variety of food wasn’t there, and the whole tone just wasn’t as excited and amped up as I thought it would be. The food was really good though! It was LOUD in there, and everyone just ate and left, maybe it just wasn’t what I was expecting? I can see how if you had a whole group you could make it really fun…but I think Disney could make it even better! QOTD: What do you eat the night before a race? *Don’t forget to vote for me for the blogger awards on Fitness magazine’s website! I wouldn’t have known this existed if I wasn’t a runner. This is where Disney holds the expos for their races. There are plenty of events held here such as Pre-season training for the Atlanta Braves and the Tampa Bay Bucs. SO, depending on the time of year, you could hit up one of different sporting events! WWOS is also home to the Playstation Pavilion. They have 17 PS3 systems, wi fi, and more. It costs $5 to play for thirty minutes. 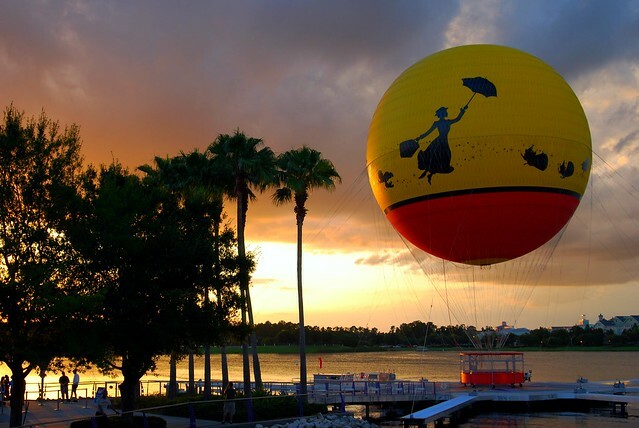 Characters in Flight: This hot air balloon located in Downtown Disney will take you a soaring 400 feet above the ground (tethered to it, of course!) for the best views of Walt Disney world. You get to enjoy your view for 8-10 minutes flying high in the sky. Weather permitting, hours of operation are 10:00 am to midnight. You can board a boat for the Wishes or Illuminations fireworks in Walt Disney World. Price of the wishes cruises includes snacks, and you can even have Private dining whip you something uo to eat onboard. What a great way to enjoy the show from the 7 seas lagoon! For the illuminations cruise, you can also have private dining have food for you, as you cruise around the water in EPCOT watching the show. Another option is the Grand 1 Yacht at the Grand Floridian. It is a 45 foot boat staffed with a captain and deckhand. Ride the lagoon in Grand style as you enjoy the Magic Kingdom Fireworks. Lastly, there is the Pirates and Pals Fireworks voyage. You are provided snacks before your voyage, where you can watch the electrical water pageant and Wishes fireworks. Captain Hook and mr. Smee may show up for photos, before you sail the lagoon, docking nearby to watch the fireworks. You may even get to see Peter Pan as the voyage concludes. At Fort Wilderness, you can take an old fashioned horse drawn carriage ride, first come first served. The ride lasts 45 minutes and departs from Pioneer hall twice nightly. During Halloween, you can book a haunted 25 minute carriage ride through the woods. Spooky! There are also Holiday “sleigh rides” that you can book in advance. There are also regular25 minute carriage rides at Fort Wilderness and Port Orleans Resort. These are just a sampling of the many, many fun things to do in WDW. This is one reason we keep going back. We do new fun things every single trip, and have a blast! If you would like more information on any of the things I mentioned above, please contact me at heather@travelwiththemagic.com and I would be more than happy to help you plan your vacation AT NO COST. Our services are free for our clients! Be sure to click on the Free Disney Travel Quote tab on my menu bar for more info and current offers! I ran 3 miles in the treadmill last night. my first three miles since the injury! It was really hard (and slow) but I did it! Next run on Thursday I will go for 3.5. Movin on up, yall! Thanks again for all the support and encouragement! QOTD: If you had Disney world to yourself for a whole day what would you do? Funny story before I tell my story. Last night, my husband asked me if I planned on doing more vlogs for my blog. I told him of course, and told him about a couple of the ideas I had for some fun ones. I then told him about the post I was going to publish for Sunday (today, the one you are currently reading.) I thought since the buzz this weekend is the Disney marathon, I would take a trip down memory lane and tell the story of how the WDW marathon weekend will forever hold a special place in my heart, because that’s where my running journey began. He asked if I had told the story before and I said that yes, I think I had in parts, but that you get new readers all the time so it’s always fun to tell an important story like that again. So I turn on my computer yesterday, save the pictures into a folder from my race recaps that I want to use, and go read some blogs before I write my post, and lo and behold, Karen had the exact same idea! Great minds think alike I tell ya. Be sure to go check out her story, as it is very very similar to mine. Let’s rewind to January of 2009, shall we? I had been a part of a message board for Disney brides and honeymooners for a few years. Several of us had gotten very close, and decided to have a “meet up” in WDW. A couple of the girls were running the marathon, so we thought it would be a great weekend to go. Karen and I had never met, but our plan was for her to drive to my parents house, fly to WDW with me, share a room with me, hang out for the weekend, then fly home. I must say, I was a bit nervous having never actually met the girl! Our first picture together. Oh how there would be many, many more in the following years! This was also the first weekend I met Jen and Crystal, both also a part of the message board. How could I have known some awesome lasting friendships would come of this? One of the most fun weekends of my life. These people are a blast. The morning of the actual marathon, Karen and I staked out a spot in front of Hollywood studios to watch the race…no particular reason for this spot. Keep in mind I was NOT a runner at this point! We waited for our friends to pass. The place we were standing was around mile 24. We somehow missed Jen and Jeff, but managed to catch Crystal! As all of the people passed by, and as I watched everyone cheering them on, all of the sudden I got really really emotional. I thought of the hard work and dedication these people had put into their training for this race. I didn’t know them, but I was so proud of them as they all passed me by. I cheered my little heart out, and decided I COULD do this, I HAD to do this! Fortunately, Karen had the same thought as me, and we vowed we would be back to run. Bobby, myself, my mom, and sister drove to WDW for marathon weekend. We had trained for this race, our very first half. Our goal was to finish in one piece and to have fun. If you are familiar with marathon weekend, you know this was the year of the freeze and the sleet. Yes. It sleeting during the half, and neither Bobby or I had the proper cold weather gear. Thankfully Jen had a bit to spare for me! We did make it in one piece, and it felt so good to cross that finish line! We did it, we were officially half marathoners! But we had not yet reached our goal. What? That’s right. My goal was the Disney full marathon. Fast Forward to January 2011. It was a tough training cycle. I was struggling with an IT band injury, and Bobby and I were not even living together (he took a new job and I lived with my parents while our house was being built, and he lived in our new town with his employer.) It was tough training basically on my own, I was under a lot of emotional stress. But, we made it to Disney! Karen ran the full with Bobby and I, and it will forever be one of the best memories of my life. We had SO MUCH FUN with the race, stopping and taking pictures with every character, goofing off and enjoying the race. I remember very distinctly when Karen and I ran by our inspiration curve outside of Hollywood studios. I got really choked up remembering where it all began two years prior. I could not believe I was about to accomplish my goal, and finish the race. Crossing the finish line was amazing, we finally did it. Two years later, we accomplished what we had set out to do, and it felt wonderful. Fast forward to January 2012. Yup. sitting on my couch. I didn’t make it to marathon weekend this year, because Karen, myself, and my mom are running the Princess half in February! Oh, and I have my sights set on just ooonnneee more teeny tiny Disney goal. Goofy 2013, I’m coming for you! QOTD: Can you remember back to what inspired you to start running or become healthy? What did it for you? We had a great patio we could walk right out to the beach from, and we were close to the lobby/lounge/front of the building. It was a little hot out, but not too terribly bad or humid. we ooed and aaahhed over our view, unpacked a little, and got ready to head to the Magic Kingdom! But not before hitting up the concierge lounge for some snacks! We headed to the Magic Kingdom, rode Pirates, peoplemover, and Buzz Lightyear, and got a nice treat because it was getting H-O-T! it wasn’t too crowded, but we were tired from driving, so we headed back to the hotel to get ready for dinner. we had appetizers in the lounge then drove to Yachtsman Steakhouse! The food was great, and we had a good time. After dinner, we made it back to the lounge to have dessert and then watched Wishes from our patio. The music was piped in, too! The beach was full of people, it was so nice to have our chairs and be in our PJ’s then just go in the room when it was over! That was day one! Tomorrow I will REALLY confuse you and jump to some running skirts fun and pictures, so don’t go anywhere! QOTD: What is your favorite Disney food?